Mitchell Kerr’s team has been getting on a bit of a roll just lately and the stable looks to be in for another very good weekend. Kerr has some excellent prospects engaged at Addington on Friday afternoon and at Rangiora on Sunday, including the debutantes William Wallace and Justasec, the latter a three-year-old and unbeaten at the trials. The two-year-old William Wallace is the first cab off the rank at Addington and only a wide draw stands between him and a successful debut, like that of Koenigsegg at Rangiora last Sunday. “There’s not much between them although they’re two entirely different horses,” said Kerr. “Koenigsegg is a naturally speedy horse, but he’s not quite ready to be the full package yet so I’ve turned him out and he can come back in the spring for the Sires Stakes. “William Wallace is a powerful sort of beast with a lot of presence and he is a stayer for the future. 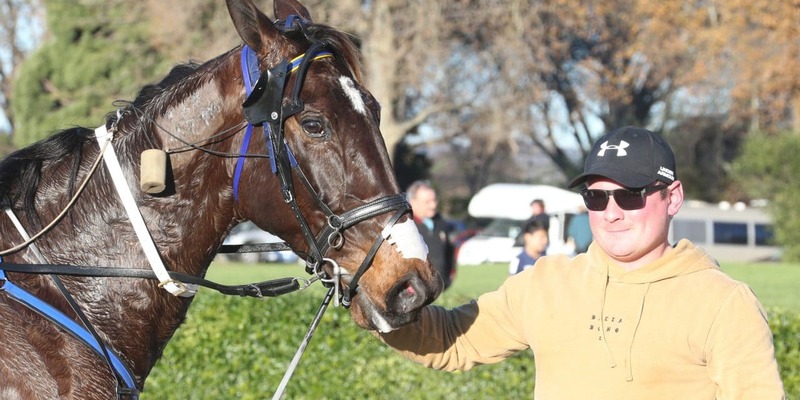 Koenigsegg, named after a high-performance Swedish sports car by Kerr’s cousin and co-owner Sam Casey, had a good tussle with fellow juvenile Peraki Reactor at Rangiora last Sunday and they were over 13 lengths clear of the other maidens. William Wallace came to light when he qualified last month at Rangiora, leading and winning over One Change after coming home in 56.6 and 28. Five days later he ran home strongly late in the piece to finish second in a 1.58 mile won by the promising Rough And Ready, who led and scampered home in 26.3. William Wallace, Koenigsegg and the filly Maharani, second on debut in a Sires Stakes heat at Addington to Amazing Dream a fortnight ago, were the three yearlings bought by Kerr’s stable at the sales last year. William Wallace was a $42,000 purchase at the Premier, while Koenigsegg cost $25,000 at Karaka. Another two-year-old filly in A Taste Of Honey, who has drawn the ace in this week’s Sires Stakes heat at Addington, is co-owned by breeder Don Bates and Kerr rates her just as highly as her stablemate. “Sweet On Me is very classy and will be very hard to beat, but I think my two fillies are just as good as the rest. “A Taste Of Honey got a bit lost (when sixth) on debut when she got back and Amazing Dream walked them around and sprinted home. Blair Orange has taken the drive with Nathan Williamson not travelling to Addington, while John Dunn sticks with Maharani. The latter is a Mach Three filly who was bought at the Premier Sale for $21,000 and like William Wallace, she is raced by a group of owners which includes All Black Anton Lienert-Brown. Longtime stable supporter Keith Ovens is not involved in the fillies, but he does have a share in Koenigsegg and William Wallace, along with Smokin By. Kerr actually rates the latter as his best winning chance over the weekend. He starts from 20m at Rangiora alongside the good mares Onedin Reign and Sociable and Williamson will drive Smokin By along with Zinny Mach and Forgotten Highway, the latter in the Rangiora Classic. “Smokin By is right in the zone at the moment and would have won at Addington last time, but for leaning in on the bend, which allowed Gran Chico to get away on him. “Forgotten Highway is in a tough spot in that field, but if he can keep the trail and they go hard enough, they’ll know he’s there at the finish. Kerr will have his first drive for the season on Justasec, a son of Big Jim that his partner Allie Paterson leased off John Vincent last year.